This one is going to be quite the feat of installation. 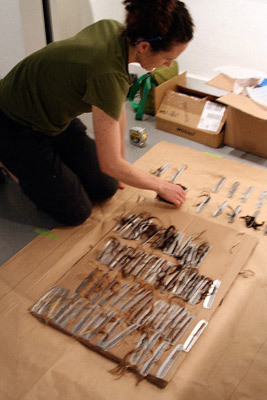 Just hours after we packed away all the Book Power books, book cases and shelves, then cleaned and patched the gallery on Sunday, our July artist, Diane Jacobs started working on her installation, which is titled Bowing to Paradox. Diane has a very ambitious plan for transforming the entire gallery into her vision of mobiles and kinetic sculptures that will make us appreciate the delicate balance of life. First step, she covered the gallery windows with black paper leaving just a peep hole you will look into from the sidewalk at a mobile made of wish bones lit from behind. 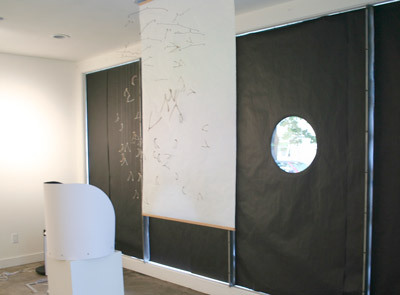 Next up, her leaves burned with lines of poetry started covering the main walls of the gallery. Then, she started nailing up close to 100 combs woven with her trademark hair. Thanks to her husband Dan’s help (the ever-appreciated artist spouses can never be thanked enough), Diane is making fast progress at what looks like it is going to be a bit of a mad dash to finish installing before the gallery opens at noon on Thursday. Stay tuned. We’ll try to post a few more photos as Diane progresses. After that, Diane will bring in a real photographer to capture the beauty she is creating and we’ll post more thorough coverage on the 23 Sandy web site. For now, you can read more about her installation here and you can preview Diane’s other work on her own web site here. In the meantime, wish her luck! Last Two Days for Book Power! How time files! It’s just hard to believe this is the last weekend to experience Book Power! This important exhibition showcases artist books addressing the social, political and environmental issues of our times. Over 40 artists from across the country and from as far away as Canada, Ecuador, China and Cuba have demonstrated that an artist book can be a powerful vehicle to shed light on the problems we face in the world and can also be a strong call for change. War, poverty, politics, violence, feminism, environmental are but a few of the issues that these concerned artists have used to engage their readers in an effort to raise consciousness, call for justice and provoke action. If you haven’t seen this exhibit yet, be sure to come by. We’ll be here Friday and Saturday, from Noon to 6:00 p.m.
Click here to preview the online catalog for Book Power! Above image: Sheets by Jessica Spring. 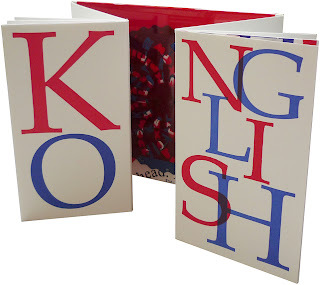 We are thrilled to announce the arrival of Jana Sim’s newest limited edition artist book: Konglish. This book illustrates the differences between how language is observed and interpreted. Sim has focused on Korean, English and Konglish (Korean+English), which is the term used for English words in a Korean context, or words made from a combination of Korean and English as a sublanguage. Sim shares her first hand experience using short, humorous anecdotes based on the differences of the languages and how they function in different cultures. The way Korean appears to English speakers can differ dramatically, as does English to Korean speakers, often leading to funny mistakes and experiences causing misinterpretation or confusion. When the book is closed, the word KONGLISH appears on the front, combined from the words Korean and English which can be seen in full once the book is opened. 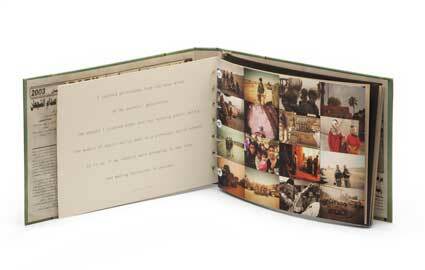 Once all the pages are read, two laser cut volvelles appear in the middle of the book. The acetate wheels have mixture of both Korean and English alphabets. The book will be experienced very differently depending on what language you speak. If you only speak one language, the other will be seen as exotic shapes and patterns. If you understand both languages, you will be able to compare and understand both sides of Sim’s stories. We would like to extend a warm congratulations to Jana for her recent award of a scholarship to continue her graduate studies from The Claxton Club in Chicago. According to the club, “The entire committee was unanimous in its admiration for your work.” The Caxton Club’s purpose is the literary study and promotion of the arts pertaining to the production of books and we are so thrilled that they have honored Jana’s work. Jana came to United States from her native Korea in September 2002. After earning her BFA in painting from University of Illinois at Urbana-Champaig, Sim relocated to Chicago and entered MFA book and paper program at Columbia College Chicago. Sim’s works can be divided into two themes where one is the Korean doors which represent the memories of childhood and past, the reminiscence. The other theme is about the difficulties she faces living as an International Student and the cultural differences between Korea and the United States. 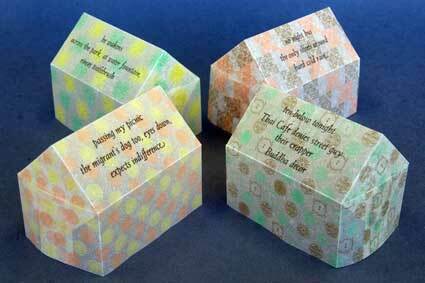 Sim started exhibitions from 2006 and her book art works are at numerous exhibitions in the US. She has been featured in several shows here at 23 Sandy Gallery and is in our regular inventory as well. To view more of Jana Sim’s beautiful work click here. 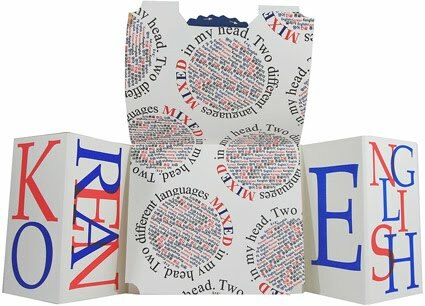 Be sure to check out Nesting, her gorgeous double sided transparency flag book. Highly recommended! Saturday, June 12, 4:00 p.m.
Join us for a special “Artists Walkthrough Event” on Saturday, June 12 at 4:00 p.m Several Book Power artists who live in the area including Mary Bennett, Stewart Harvey, Diane Jacobs, David Kearns, Jim Lommasson, Edgar Papazian, Randi Parkhurst and more will tell us the stories behind their fascinating and compelling books. 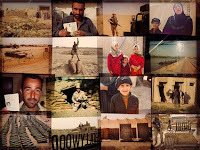 Bring tissues, Jim Lommasson’s book (shown) contains the words and images of returning Iraq war veterans and is especially moving. This announcement is so timely given our show in the gallery this month featuring book arts about social, political and environmental issues. 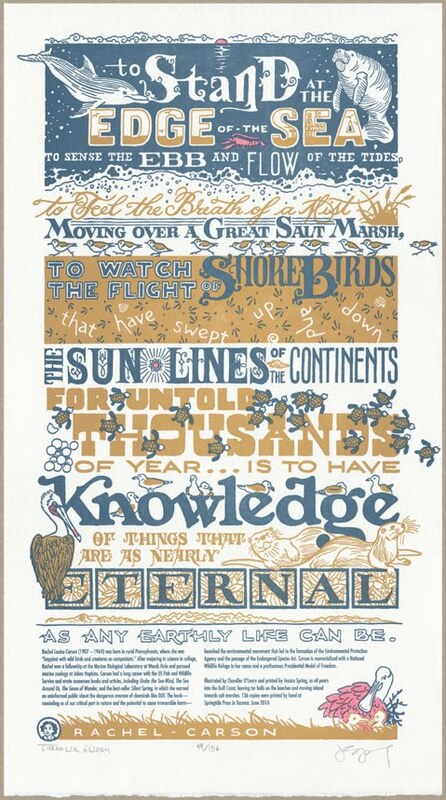 Chandler and Jessica are the first artists I’ve seen who have responded to the Gulf oil disaster and this looks like a really incredible broadside. Below is an the info Chandler sent me. Buy this one quick. It will sell out fast! Hello, everybody! So far we’re having a cold and wet summer here in the Pacific Northwest, but for our eighth Dead Feminist broadside, our thoughts have turned to the sweltering Gulf Coast. “Drill, Baby, Drill” debuted yesterday at the Gig Harbor branch of the Pierce County Library, where we gave a presentation about the series and the process behind it. 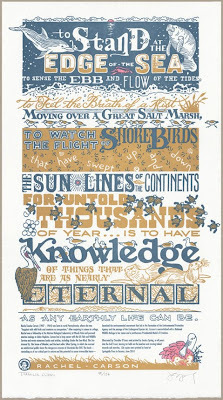 The broadside is letterpress printed from hand-drawn typography and illustrations, on archival, 100% rag (cotton) paper. Each print is also hand-colored, and individually numbered and signed by both artists. We are donating a portion of our proceeds to Oceana, an international organization focused on ocean conservation and dedicated to ending offshore drilling. Rachel Louise Carson (1907 – 1964) was born in rural Pennsylvania, where she was “happiest with wild birds and creatures as companions.” After majoring in science in college, Rachel won a fellowship at the Marine Biological Laboratory at Woods Hole and pursued marine zoology at Johns Hopkins. Carson had a long career with the US Fish and Wildlife Service and wrote numerous books and articles, including , The Sea Around Us, The Sense of Wonder, and the best-seller Silent Spring, in which she warned an uninformed public about the dangerous overuse of chemicals like DDT. The book—reminding us of our critical part in nature and the potential to cause irreversible harm—launched the environmental movement that led to the formation of the Environmental Protection Agency and the passage of the Endangered Species Act. Carson is memorialized with a National Wildlife Refuge in her name and a posthumous Presidential Medal of Freedom. A few copies of the previous three prints in the series are also still available, as are reproductions of the first seven broadsides, offset-printed as oversize postcards. The postcard reproductions of the first seven Feminist Broadsides are priced at $1.75 each, and can also be purchased via Etsy or email. Every new subscriber, starting with either “Drill, Baby, Drill” or the three previous prints, will also receive one free set of postcards. Many thanks, as always, for your continued support and comments! Lommasson has not included any of his own photographs or writing in this piece, stating, “I want this book to feel like it is its own thing, with no outside authorship. I would like an unsuspecting viewer to wonder where the book came from, almost as if it fell out of the sky.” To add impact, Lommasson utilizes scanned copies of the last Iraqi newspaper published while Saddam Hussein was in power. We’re sure you’ll find this book thought provoking, enlightening, heart wrenching—and powerful. To view more of Jim Lommasson’s book and the Book Power! catalog, click here. 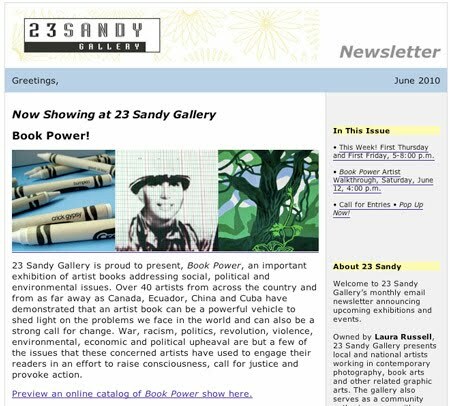 One of our amazing Book Power artists, Mary Bennett, was just featured in a blog post over at the Portland Open Studios blog. 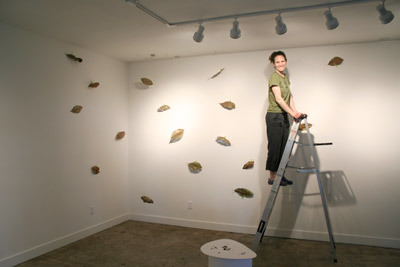 Portland art fans should be very excited to have Mary’s talent and enthusiasm in town. (I know I am!) Can’t wait to see what see comes up with next. Read the post (written by another of our gallery favorite artists, Shu-Ju Wang) here. Can you believe it is June already! We are getting very excited for the new show this month. 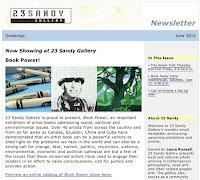 We just sent out our monthly gallery newsletter. In case you are not on our email mailing list, you can read it here.